Jennifer's Pretty Purse is a simple messenger bag with front flap, rear zippered pocket and a single strap. 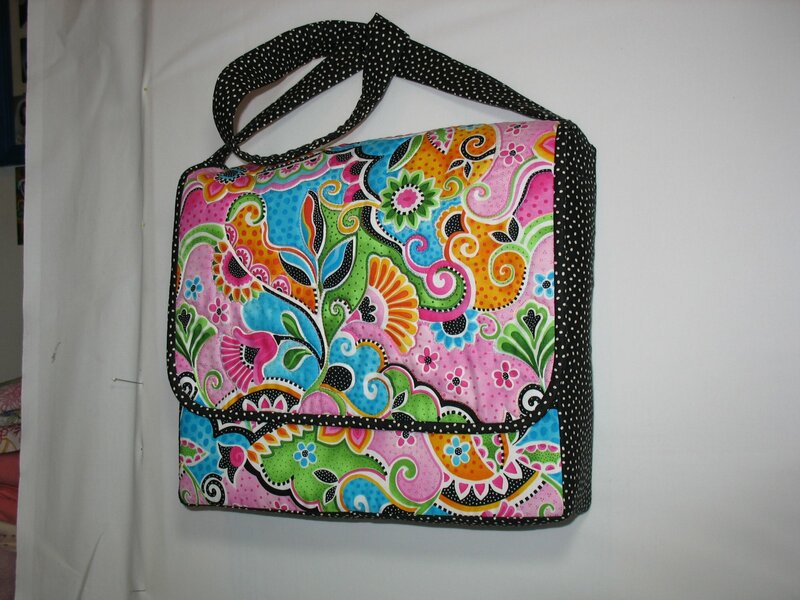 Pick a bold "theme" print fabric and team it with a coordinate to make this easy 12 1/2" x 11" x 3 1/2" bag. Give it a bright lining and you'll love this pretty purse with room for a small laptop or notebook computer. It features full-sized zippered inner and outer pockets, file and phone pockets. Kits come in a variety of bold fabrics (pictured pink fabric no longer available) in turquoise, purple, black multi, black/lime green etc. Kits include the three fabrics and pattern to make the bag. To complete the project you will need 5/8 yd fleece batting or a small package of "byannie's Soft and Stable" foam batting for bags; sewing and quilting thread; 6" hook and loop tape; two 12" - 14" zippers to match bag fabrics; and magnetic purse snap.